On Tuesday, March 9th, CatholicTV will air a special program called “The Heart of Haiti”. The Heart of Haiti was filmed during the first week of March when a committee of Catholic Bishops and one priest travelled to Haiti to assess the needs of the Church there. The Heart of Haiti features detailed footage and imagery of Haiti, including the ruins of the Cathedral, where Archbishop Serge Miot and many others died during the earthquake of January 12th. More people died during the Haiti earthquake than at Hiroshima. The Heart of Haiti will air at CatholicTV.com and on CatholicTV on March 9th at 11:30AM ET and again at 8:30PM. The Heart of Haiti also includes footage of Catholic Relief Services’ efforts and interviews of local people, doctors, volunteers, and numerous thoughts and reactions from Cardinal Séan O’Malley Archbishop of Boston and other clergy. 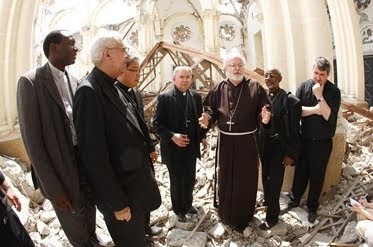 The committee of clergy asked to go to Haiti to access the needs of the Church there include: Archbishop José Gomez of the Archdiocese of San Antonio, Bishop Guy Sansaricq, the only Haitian-born U.S. Bishop, Bishop Tom Wenski of Orlando, Cardinal Séan O’Malley, and Fr. Andrew Small of the United States Conference of Catholic Bishops (USCCB).